Congratulations! You've decided to live in the greatest city in the world! Now you just need to find an apartment, which is no small challenge in this competitive and dynamic market unlike any other. Let Anchor Associates help you understand the basics of renting in this market. This guide will prepare you for the fast-paced nature of NYC rentals, orienting you to all the information you'll need to find a great place to call home! The following tips will help focus your NYC apartment search and will maximize your agent's ability to land you the apartment of your dreams! Do you have a preferred Manhattan neighborhood? Near public transportation? Parking available? What are the features of the neighborhood? : stores, recreation opportunities, restaurants, schools, distance to work, etc. Building with elevator or a walk-up? What type of apartment? What type of building? NYC real estate terms can be overwhelming. Familiarize yourself with the various types of buildings and apartments: pre-war or post-war, lofts, brownstones, modern apartments. What size of apartment? Studio, 1 bedroom, or larger? Determine the price range you can comfortably afford. What is your target move-in date? Are you prepared to make the necessary payments to secure your apartment? Apartments that are available today are likely to be gone next week, or even by the next day. While you can always keep an eye on the market, your ideal apartment will likely only be secured if you're ready to act quickly. Your Anchor Associates agent will work with you to clarify the questions and answers that will help you define what an ideal apartment is for you. When meeting with your Anchor agent for the first time you will be presented with 2 forms to sign. 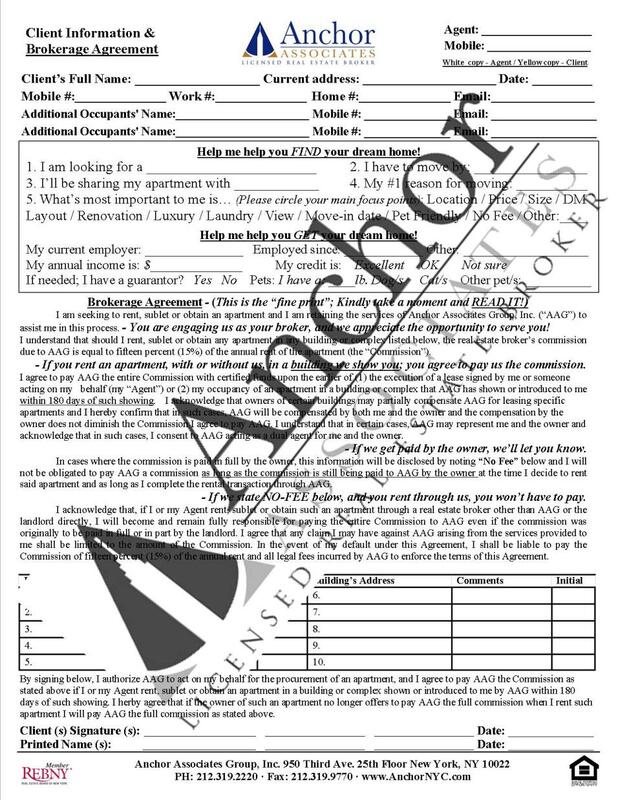 The first is a Department of State required Agency Disclosure form, which establishes the agency relationship between you and Anchor Associates. You may preview the form here or view it on the DOS web site. 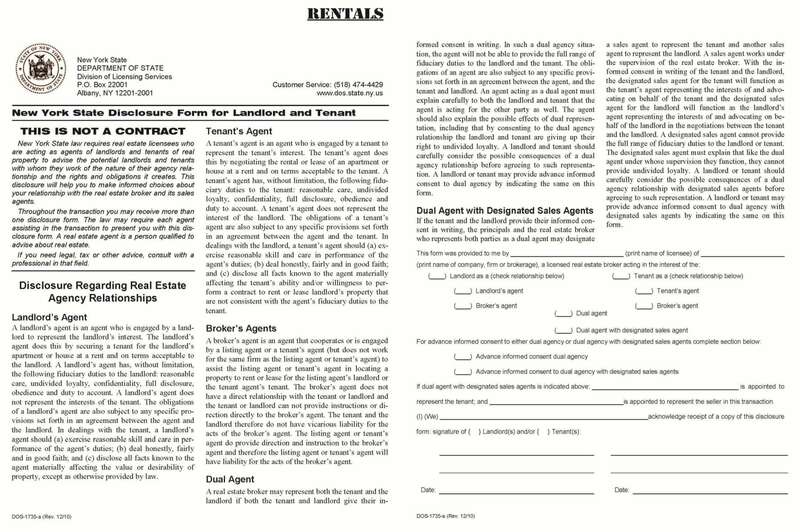 The second is the Client Information and Brokerage Agreement form. This form will provide us with additional information about your search criteria and will help us better serve you. The form will also establish the conditions of our working relationship and will clearly define the commission structure and boundaries of our working relationship. You can preview this form here and you will also be receiving a carbon copy of both these forms. If any part of these forms is not clear to you, please ask your agent to explain it. If, for some reason, you were not presented with either of these forms, we would greatly appreciate you contacting one of our managers as soon as possible. Copies of recent pay stubs. Tax returns and W-2 forms from the past 2-3 years. 3 recent bank statements or a letter from the bank indicating how long you have held an account there and confirming the status, balance, and history of your accounts. This letter, preferably on letterhead, should speak to your history as a tenant. How long have you lived at your current address? What was the rent you have been paying? Do you have a history of paying on time and in full? Most landlords or their agents will perform a routine credit check. You may want to review your credit report in advance to determine whether there are any outstanding balances that would negatively affect your prospects or to prepare yourself to explain outstanding debts. An average or poor score may not necessarily screen you out as a potential tenant; some landlords are willing to accept tenants who can provide a guarantor, or a person who will serve as a co-signer and will accept responsibility if you default on rent payments. Typically, the guarantor is required to provide all the same financial information that you yourself provide. If you believe you may need a guarantor, it is critical to speak with this person first and advise them as to the level of their responsibility. Having this package prepared and organized will impress a prospective landlord and will speak to your organization and commitment as a prospective tenant. It's no myth that NYC apartments are expensive. Landlords are generally looking for a tenant whose annual salary is 45 times his or her monthly rent. This does not necessarily screen you out if you do not meet that income ceiling, but it helps you understand the nature of the NYC real estate market. Be aware that renting a New York City apartment typically requires having a substantial cash reserve to cover initial costs. In addition to the broker fee, these costs may include: security deposit (equivalent to one or more month's rent), first month's rent, and, increasingly, an amount equivalent to the last month's rent. The landlord or agent will typically charge you for the cost of the credit report ($25-100) and may also charge an application fee, which may range from $100 to $400. Be sure to ask whether there is an application fee for the building, and determine whether the fee is refundable (most are not). Be sure that you ask up front whether personal checks are accepted (they usually are not) or whether you will need to make these payments in the form of a cashier's check, cash, or another form required by the landlord. Yes, the market is fast-paced, and both you and the landlord will want to close quickly on your rental deal. However, it is critical that you take the time to read your lease carefully and have any questions answered. Do not rely upon verbal assurances; any negotiations or changes to the lease should be attached to this primary document as a "lease rider" (or simply, "rider") and should leave no room for doubt in your mind or in that of your landlord. What does a NYC No-Fee apartment mean? How much rent can I afford in Manhattan? What do Manhattan management companies require? How important are credit reports?